The perfect Sunday meal after an autumnal walk. Slice the two of the onions, add to a pan with 25g butter and season, cook slowly for 30 minutes until soft. Peel and roughly 1cm dice the carrot, celery, leek and the final onion. Peel and slice the potatoes 2mm thick. Heat the large pan, season the lamb fillet pieces and using olive oil seal them off with colour on all sides. Remove from the pan and reserve. Add a dash more oil and add the onions, celery, leek, carrots and rosemary, season well with salt and pepper and allow to cook slowly. After 10 minutes, remove from the heat and remove the vegetables from the pan. Add the first two onions cooked in butter to the base of the pan and place the lamb on top. Now place the sweated vegetables over and press down. 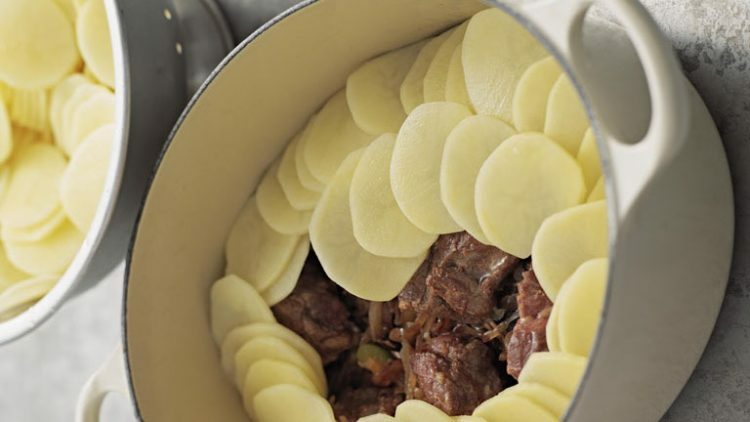 Now using the sliced potatoes, overlap them around the pan until three layers have been achieved. The last layer should be nice and tidy. Ladle in the hot stock until you can just see it. Season, add a knob of butter and the fresh thyme leaves and place into the oven for 2 hours and 20 minutes. Remove from the oven once cooked and allow to relax for 10 minutes.